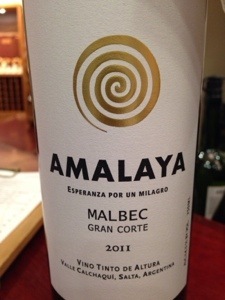 I love Malbec, Argentinian or French. They have their nuances but both regions offer up really juicy , meaty wines that offer power and finesse at the same time. This one is particularly good at both characteristics. Dark purple in the glass with strong blackberries and vanillin on the nose. Very smooth on the initial attack of dark fruits and integrated oak. Flavors of chocolate and some cassis come through on the back end. The tannins sneak up and leave a refreshing dryness on the gums. We’ll integrated and balanced. This is a tasty wine for $39 a bottle. I just had a glass at the airport before traveling to Cali. 91 points and 4 stars. This wine is superb on its own but I bet it would kill a Filet Mignon. Treat yourself! Salut….